We do a lot of things in our everyday life and make a note of it. But what if all this data is lost? Thinking of this, a good idea comes to mind to create a backup copy of all the data. Don’t you think it’s possible? It is actually possible – with SyncMate. This wonderful tool helps creating a backup of your events, contacts, reminders, bookmarks and more. 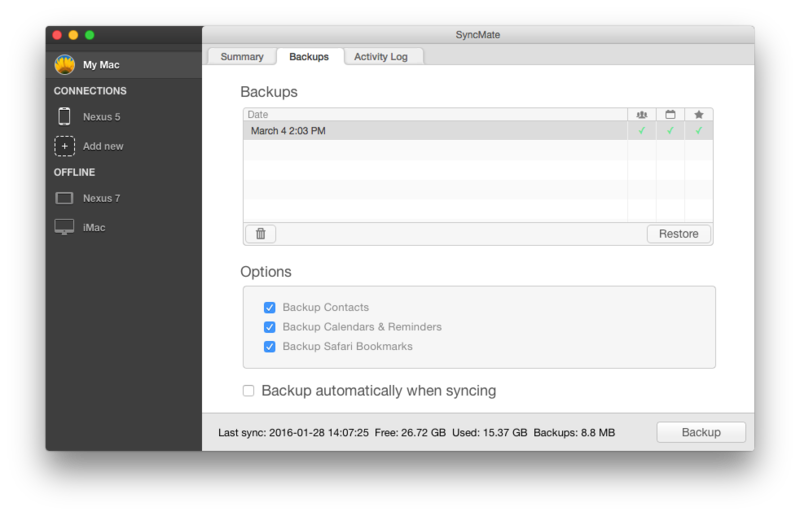 SyncMate is a powerful syncing tool that can keep your data on Android and Mac updated with each other. With the free version of the tool you can sync contacts and calendar events, and read your text messages on Mac, while with SyncMate Expert, you can sync images, videos, folders, music and more. You can also create, read and delete text messages on your Mac using its keyboard with SyncMate, an app to back up Android data on Mac. You don’t have to go through a complicated process. However, keep in mind that for creating a backup file, you should first start the syncing process from Android to Mac. Download the free version of SyncMate on Mac and install it. You will have to upgrade to the Expert version as the “Backups” plugin is a part of it. However, don’t miss trying the free version of the app before upgrading. After opening the app, you will find “Add New” link on the left which you will have to click. Choose the Android device and connect it to your computer. Select the data to be synced for later backup. Hit the “+” key at the top and choose “Calendars”, “Contacts”, “Safari Bookmarks” or “Reminders”. Now personalize each of the plugins to your requirements. Hit “Sync” to initiate the process. After the process is finished, go to “My Mac” on the left, then to “Backups” tab. Choose the data you want the backup of. Click the “Backup” key to generate your backup file. During every syncing session, activate automatic backup. This way you will have the most convenient setup. If you want a backup created earlier, choose the required one on the list and hit “Restore”. Next sync data to Android from Mac.